Join the 2018 Fiesta on the Hill on Sunday, October 28, 2018 from 10 am to 4 pm on Cortland Avenue. This year, they’re celebrating Bernal Heights Neighborhood Center’s 40th birthday with a Costume Parade and Marching Band at noon. Fiesta on the Hill celebrates the diversity that is integral to the rich fabric of Bernal Heights and its surrounding neighborhoods. It’s a family-friendly, alcohol-free festival featuring activities and entertainment for all ages. 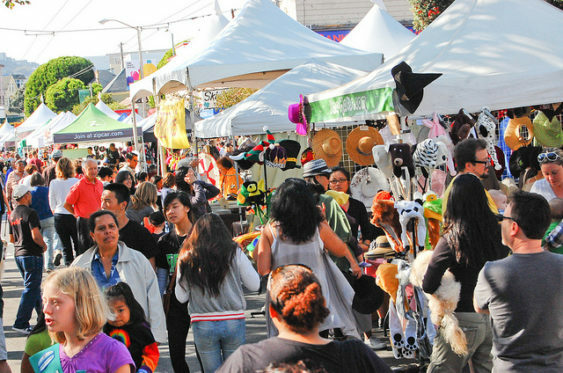 Fiesta attracts thousands of people from around the San Francisco Bay Area and spread out over 7 blocks with arts, crafts, local goods/services and food vendors. Highlights include live music, dancing, a children’s area with rides, games and more. Don’t miss the Bayonics and Bernal’s own Adelante.